Sharps Mail Back systems are becoming more of a standard for healthcare facilities and non-healthcare facilities that may have employees or family members that self inject. Certain government bodies provide guidance as to how you can dispose of waste and what to do if you have a situation where a employee or family member is stuck by a needle. Waste disposal for medical or healthcare facilities is heavily regulated by federal and state entities. What's important to know is that all groups are required to store their regulated medical waste including sharps waste in containers marked with a bio hazardous symbol to identify the waste as being hazardous. Most healthcare facilities have designated areas in which they even store filled containers until the either ship back their waste using sharps mail back systems or they use waste disposal medical companies to dispose of their quart containers or large bio hazardous waste bins. Most low volume facilities are paying very high waste disposal medical rates for unregulated waste such as unsoiled gloves, unsaturated gauze, urine cups and more. More and more pharmaceutical companies are developing new technology to make self injecting easier and less painful. The old days of 1cc syringes and pharmaceutical vials being stored in the refrigerator are a thing less common now with the increased use of auto injectors. This means the number of self injectors will likely grow and the increased concern for proper disposal of a used auto injector will become a major issue that is currently unregulated. 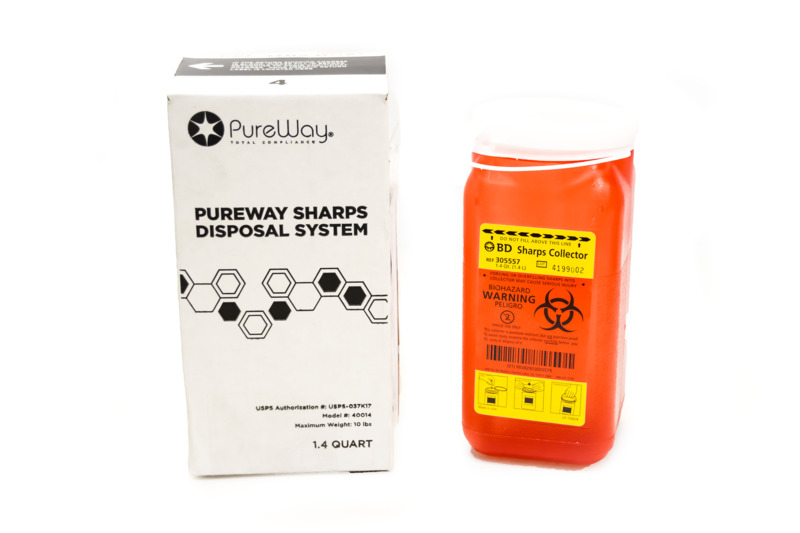 PureWay Compliance, Inc. has partnered with multiple pharmaceutical companies to proactively provide sharps mail back systems to their patients that self inject which is a wonderful way to support patients and enhance their patient support programs. Sharps mail back systems are simply a sharps container (quart container or larger) that has been designed to safely container and ship regulated materials such as sharps waste.